Update May 2017: Glenbrook proposal is now back on the table. Cockburn Cres refused. Harlaw Gait refused. Ravelrig is already going ahead. 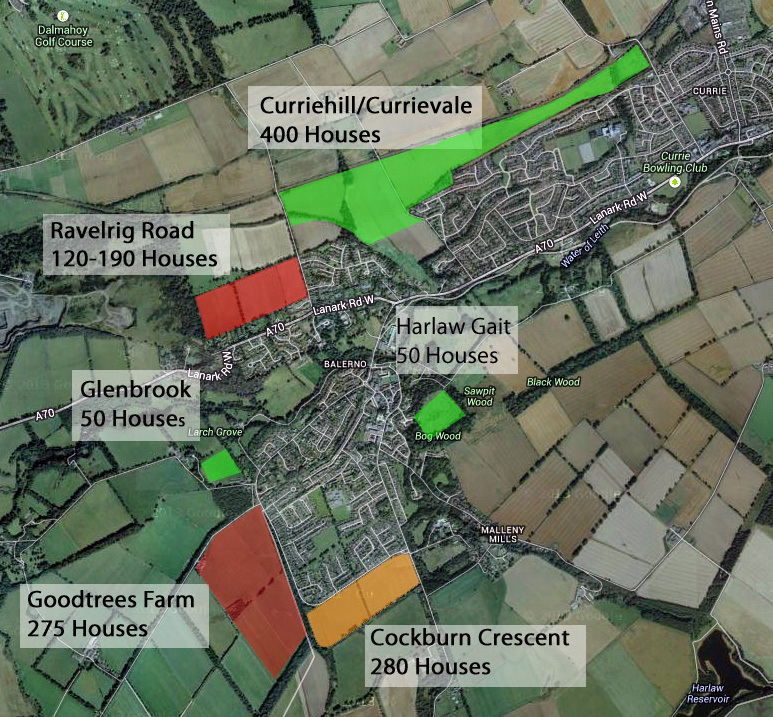 Currievale not proposed – but Newmills will probably go ahead, making Currievale likely over the longer term. All of these proposed developments are speculative attempts by developers to build on the Green Belt. These sites have not been allocated for development and the proposals are contrary to current planning policy. It is by no means inevitable therefore that any of these attempts to breach the Green Belt will be successful. The South East Scotland plan (SESplan) requires that development in West Edinburgh is focused within the West Edinburgh Strategic Development Area (SDA). The West Edinburgh SDA is recognised as a highly sustainable location for new development which will reduce carbon emissions. Basically it proposes development around the Newbridge / Airport / Hermiston / Maybury area, benefiting from the new tram line and infrastructure. SESplan states that “within the South West Edinburgh SDA…any additional housing land allocations will be determined through the LDPs following the preparation of the supplementary guidance”. I.E. No provision is made by SESPlan for housing outwith this area. SESplan also supports the Green Belt in Local Development Plans, to maintain the identity & landscape setting of our settlements, and to ensure that new development is directed towards brownfield sites. This policy also ensures that developers are steered towards brownfield sites that are suitable for development, rather than highly profitable Green Belt sites. 2. It deprives us of productive agricultural land. This will be important as climate change necessitates shorter food chains. 3. It destroys the rural landscape of our community – some of these areas are also candidate Special Landscape Areas in Planning terms. 4. It undermines the built, conservation character of our village. and our Lanark Road is already congested. We have nowhere else for the extra vehicles to go! their cars to avoid these risks,. developers nor the council are inclined to put this right- despite what the developers may promise at this stage. – the LDP fails to meet the requirements and obligations of the City of Edinburgh in terms of affordable housing, infrastructure provision, biodiversity, air quality, congestion and climate change, and therefore requires that all the proposals relating to greenfield sites be removed from the plan.